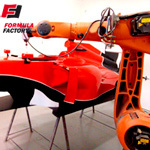 Formula Factory™ unquestionably is the global leader in F1 simulator car and formula show car production, our team brings proven expertise and the best products to customers worldwide. Formula Factory™ services, designed to meet the needs of private individuals, and large corporations. With customers from Europe, Middle East to South America and USA the Formula Factory™ Team helped to take the success by storm. Our team investigates the latest technologies and provides solutions on what will shape most effectively your projects. Control and balance make it a beautiful experience. Just a great painting is more than canvas and paints, there are some things that go beyond the sum of their parts. The F1ShowCar™ is such an object. The Formula Factory™'s goal is to afford the ultimate driving experience. In precision, in engineering, in comfort. You don't sail a boat just to get across the water. The fun is the doing. The pleasure of motion under control. F1Showcar™ owners understand that. All of our cars are Computer Designed, Robot milled products and made out of high quality materials by the best engineers of the industry for ultimate precision. Do not let foo you by bottomline suppliers who maybe create you a car looking sculpture with imprecision, fragile or too heavy materials. In a beautiful car you can play various driving f1 simulator games whether it's a motion Formula 1 simulator or a static car. With an authentic racing cockpit design and a steering mounted shift that give you a beautiful feeling the instant you're inside. This car has come amazingly close to that goal; each year, with subtle improvements, a bit more. First, consider its superbly thought-out features. It has a true motion F1 simulator and stunning bodywork. And the design has been steadily improved upon for 12 years. All controls are meticulously engineered to be functional and logically accessible. Yet it is the total effect of these innovations that impress. With the cushioned luxurious bucket seats, you ride in "Belle Epoque" comfort. But the grandest feature of the F1Showcar™ is the experience of driving it. The handle is quick, correct, precise because of Formula Factory™'s legendary engineering. Putting the driver and car in perfect collaboration. It is almost you just "think" wherever you want the racecar to go. You can go for racing in Monaco, Australia, Italy, Spain, USA and dozen of other famous racetracks in a blink of an eye. But be warned. It is very difficult to be humble about owning an F1Showcar™. And if is it's a motion Formula 1 simulator, that's it. • You can rent the car for corporate events: trade shows, team buildings… Yes another way to make US$ 1500 / day. • Rent it for shooting commercials… Aha… you can make even more money on it. • You can use the car for Pay Per/Ride service. The Pay Per/Ride fee is based on your location; you can ask easily US$ 10/qualification (3 laps single rider) or US$ 100 or more per racing event (20 laps racing with other drivers). You need to schedule the crowd and the business precisely, this is not a cheap ringlispíl. It is a unique machine that Formula 1 drivers use for preparation before races. You can make a contest among the drivers as well. The drivers will return each week, even each day to win the contest. The winner of your contest can earn a racing ticket, a complete trip to a racing even a racing driver school. • This car will improve your store traffic. If you are a store owner or a restaurant owner then you can sell racing merchandises also and plenty of your guest will go to your store just see the car. It will skyrocket your place's traffic..
• You can use your car for several years without any modification. After a few years you can repaint it and use with a different outfit. 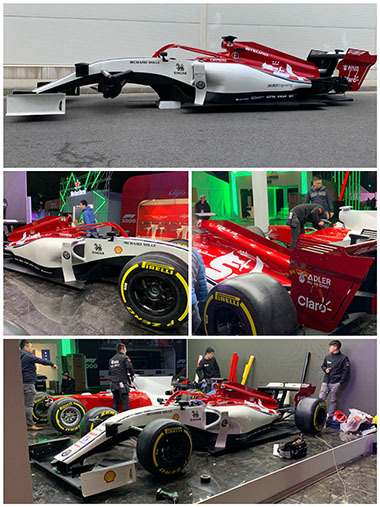 We sold cars to Formula 1 drivers (yes, drivers from Formula 1) who where satisfied with the quality of our F1 replica cars, pit stop cars, motion F1 simulator cars and display cars. We sold cars to Rally World Championship contenders as well. We sold cars for private collectors and other racing enthusiasts. We sold cars for go-kart tracks, restaurants and other stores. We sold complete promotion campaigns for famous brands and the winner of their campaign won a Formula 1 car driving experience… Yes, all above is true and correct. Please check out our gallery for images. Our car replicates the latest race cars, with all the appropriate control devices and the best virtual racing simulation software. You or your customers can race against computer generated competitors in a full size racing car. The racers can set up suspension, gear ratios and wings, calculate fuel loads. Deal with variable weather conditions. You also can order our cars without simulation devices for only show car purposes. We adjust the ywings according to your design needs and deliver the car just in time with professionalism. If you need a reliable partner with unbeatable price-quality combination we are there for you. All of the F1 simulator equipments are products of World Leader manufacturers, extremely reliable and easy to upgrade. You can use our cars with superb spare part support worldwide. Car without brands: If you need a beautiful car for your campaigns but you are not sponsor of any famous racing team you still can organize extremely successful promotions with an unbranded display car. You can use your own colors and brands on your own virtual race car. Please check out our gallery about a red racing car. We deliver Worldwide with professionalism: we package your car and ship it to your destination. You do not have to worry about transportation, seat back relax and we organize the delivery door to door.